Atlantic Kitchen Wakame Seaweed leaves have an asparagus-like mineral flavour, making them an ideal addition to soups and salads. Experiment wildly and enjoy! Place in a bowl and cover with hot water for a few mins to taste, then drain. Can also be added directly to dishes during cooking for a mineral boost. Wakame is naturally rich in iodine. If you are sensitive to the effects if iodine we recommend seeking medical advice before consuming. 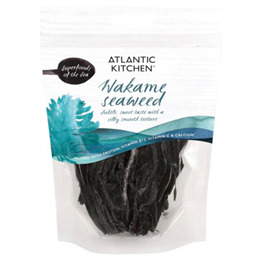 Below are reviews of Atlantic Kitchen Wakame Seaweed - 40g by bodykind customers. If you have tried this product we'd love to hear what you think so please leave a review.